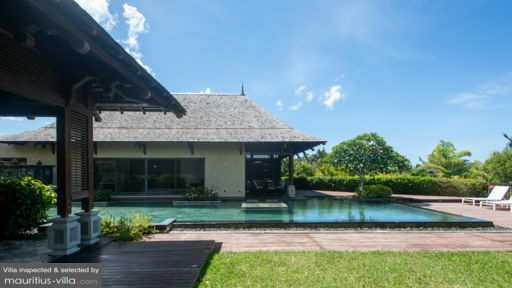 Offering unblemished views of the islet of Gunner’s Point, Villa Calypso is a five-bedroom establishment that will help you enjoy the very best of Mauritius. Overlooking the sparkling ocean, this villa boasts a bright and welcoming interior for a homelier feel. 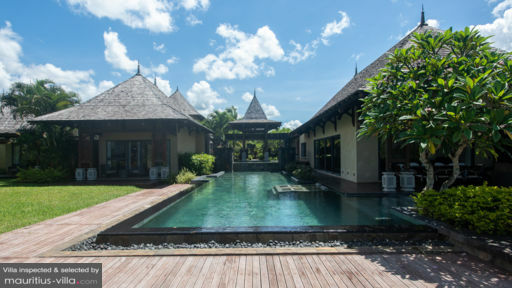 This villa is set in the charming village of Bel Ombre which offers tranquil streets lined by sugarcane fields and mountain ranges, perfect for a relaxing stroll in the afternoon. With a stay at the villa, the ocean will be just a few minutes away so you can enjoy a swim anytime that you want. Guests of Villa Calypso can choose between five bedroomsthat can comfortably sleep up to ten guests. Three of these rooms are master suites and offer en-suite bathrooms. In the master bedrooms, you’ll also find safes where you can stow your valuables during the duration of your holiday. Some of the bedrooms also offer scenic ocean views. They also feature a total of three king-sized and two queen-sized beds. There’s even a crib in a common space for infants or babies. In the perfectly-manicured grounds of Villa Calypso, you’ll find an exquisitely refreshing plunge pool, perfect to cool off after a sweltering tropical day. Around the pool you’ll find a set of sun loungers where you can lie back and relax as you catch those warm rays. Rest assured that the garden of Vilal Calypso offers plenty of space for an outdoor gathering with your friends and family. There’s even an outdoor seating area on the patio, perfect for barbecues or Al Fresco meals. Elegant, bright and airy, there’s no denying that the beautifully-furnished living areas of Villa Calypso are perfectly set up for those lazy days when you don’t feel like going out. The generously-sized living room offers an L-shaped sofa and even a flat-screen television with satellite English and French channels. Since this is a self-catering villa, you will also find a perfectly-appointed, state-of-the-art kitchen that comes with various types of amenities and equipment so you can prepare your own meals, right there at the villa. There’s also a dining area where you can gather and relax over a meal at the end of the day. As a guest of Villa Calypso, you will be able to enjoy a variety of perks such as a complimentary housekeeping service to take care of these tedious house chores. Indeed, not one but two maids will show up every day- except public holidays and Sundays- to do the washing up and general cleaning and maintenance of the villa. In fact, they will also be happy to prepare your favorite meals- local or international- on those days when you don’t feel like cooking. Guests of Villa Calypso can also enjoy the numerous facilities offered by the nearby Sofitel So hotel to enhance their holiday in Mauritius. Therefore, you will be able to make full use of the private stretch of beach in front of the hotel, kid’s club, restaurant, spa and even tennis club of the hotel during your stay at the villa. Two golf carts will also be at your disposal should you wish to move around the vast estate. 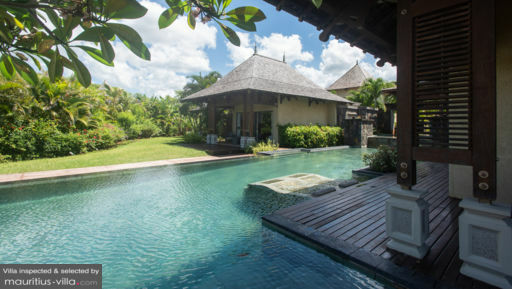 Villa Calypso places you near some of the most picturesque golf courses in Mauritius where you can practice your swings while enjoying the tropical sun.